On International Women’s Day, we remember some of the important women in the history of Bidston Lighthouse and Observatory. Elizabeth Wilding, Liverpool’s first female Lighthouse Keeper. When Richard Wilding, keeper of Bidston Lighthouse, died in March 1797 at the ripe old age of 85, the Liverpool Dock Committee needed to appoint a successor. Richard’s widow, Elizabeth Wilding, 35 years his junior, had already been doing a lot of the work, so she was the natural choice but for one problem – she was a woman. Perhaps the Dock Committee were influenced by the fact that Mrs Cormes was doing a good job for the Chester trustees at Point of Ayr Lighthouse at Talacre, following her appointment as Lighthouse Keeper in 1791. Anyway, the Dock Committee did take the bold step of appointing Elizabeth in April 1797, albeit with some unusal conditions attached. Elizabeth died in service only three years later, and was succeeded by her son-in-law and assistant William Urmson, a former sea captain. She must have done a good job, because in later years the Dock Committee did not hesitate to appoint female keepers at other lighthouses – unlike Trinity House, who never appointed a woman as Principal Keeper in 500 years. When John Jones was dismissed as keeper of Leasowe Lighthouse “for intoxication and insubordination” in 1854, his wife Ann was appointed as keeper in his place. Leasowe’s last lighthouse keeper was Mary Elizabeth Williams, who served from 1894 to 1908. And at Bidston, we had the Urmson sisters. William Urmson was assisted by his three daughers Ann, Jane and Catherine. This contemporary account by George Head in 1835 is delightful and illuminating. Biddestone Hill, about three miles from Woodside, commands an extensive view of the country inland, while the forest of signal poles, with which the lighthouse is surrounded, give it, at a distance, an extraordinary appearance—that of a dock or harbour on the top of a hill. Hence the merchant vessels bound to Liverpool are signalled and telegraphed in the offing, the poles alluded to bearing the private signals of different individuals. And what must be remarked as rather singular is, that, notwithstanding the arduous duty which necessarily falls on the station, the whole is performed, almost exclusively, by young women, daughters of the veteran in charge. The old man, who is thus ably supported in the winter of life, is fourscore years old, and has held the office upward of forty years. Although boys are employed to run backward and forward, out of doors, with colours to the poles, and haul them up; and one of the three young women is married, and occasionally assisted by her husband; yet it is she who, being perfect in the whole code of signals, performs the responsible part of the duty. This couple were both at work together at the time I arrived, the young woman keeping the lookout, and calling the numbers, while the man, merely at her bidding, pulled the ropes. She not only kept him employed, but managed meanwhile to iron a shirt into the bargain. The business of the youngest sister is to attend the light, consisting of eleven Argand lamps, with plated reflectors. Every four hours during the night the lamps are trimmed; these, the stove, copper, oil jars, and paved floor, are preserved in a state of cleanliness not to be exceeded; while no doubt, many a mariner, on a wintry and stormy night, both knows and feels that his life and safety are thus well confided to the never-failing care of — woman. The old man in the story is William Urmson, who died later that very year. The three women were the surviving daughters of his second wife: Ann (who was to succeed William as keeper), Catherine (the youngest, who attended the light), and Jane (who kept the lookout and called the numbers). In their turn, Ann and Jane respectively held the offices of lighthouse and telegraph keeper in their own right. But you would glean a very different impression from the census records, which list Ann only as the wife of John Urmson, Lighthouse Keeper and Jane as the wife of Thomas Nichols, Telegraph Keeper. Urmson was both Ann’s maiden and married name; her husband John was a second cousin. Arthur Doodson, the man behind the mechanical tide predicting machines at Bidston Observatory, exclusively employed young women to operate them. Their job title was “computer” and an essential qualification for the post was good handwriting. These young ladies computed tide tables around the world, including those that were used to plan the D-Day landings. Valerie Doodson née Boyes, Jean Harman née MacFarlane, Dorothy Ainsworth, Eunice Murrell née Heath, Barbara Trueman-Jones, Margaret Lennon née Weston, Sylvia Asquith née Brooks, Margaret Ireland née Wylie, and Olwyn Branscombe. Observatory staff by the one-o-clock gun. For seventy-seven years, Mary Connell was a constant presence on the hill that she loved. She moved into the Lighthouse Cottages in 1937 with her parents Mick and Mary Connell and younger sister Patricia. She worked as a funeral director for many years, and walked her dogs on Bidston Hill twice a day. 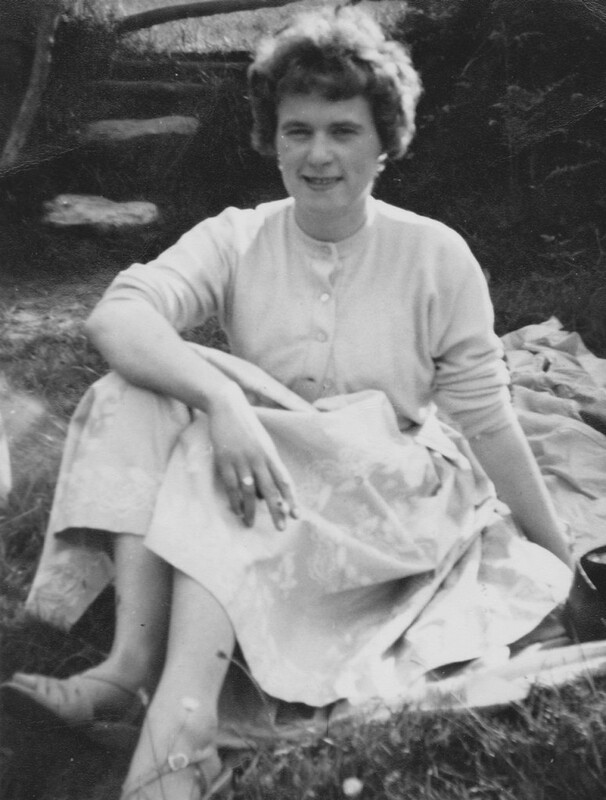 She fought the combined lawyers of Wirral Borough Council and the Natural Environment Research Council for the right to stay in the Lighthouse Cottages, and against all the odds, she won. She was in her seventies when ill health forced her to retire. After the Proudman Oceanographic Laboratory abandoned Bidston Hill in 2004, Mary was the only person living on the site (until guardians were eventually installed in the Joseph Proudman Building and the Observatory). Her only defenses against the disaffected youths who prowled the site at night were a walking stick, her sharp tongue, and the brambles she allowed to grow around the Lighthouse Cottages. Her sharp tongue was the most formidable of these. We miss her. This entry was posted in Bidston Hill, History, Lighthouse, News and tagged BidstonLighthouse, BidstonObservatory, History, keepers, lighthouse, telegraph, women on 8th March 2017 by admin. In 1878, William Gawin Herdman’s “Pictorial Relics of Ancient Liverpool” was re-published in two oversized volumes. Plate 67 depicts the Lighthouse and flag signals on Bidston Hill. It is captioned, intriguingly, as “Bidston Hill Observatory 1830”. 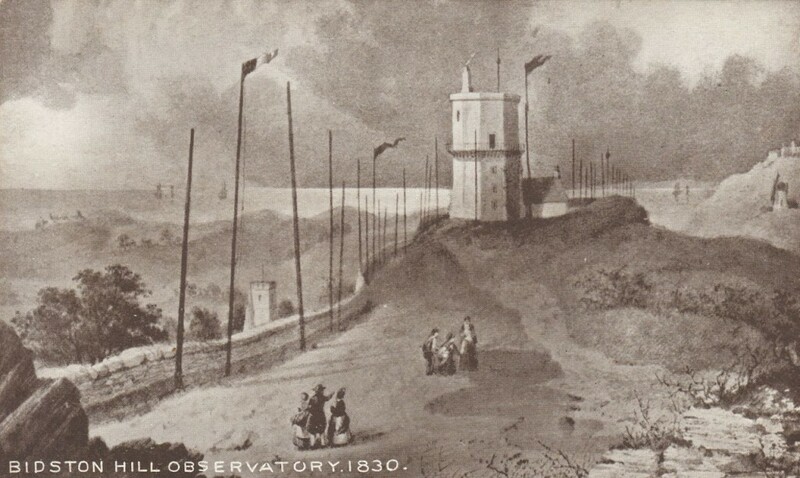 Bidston Hill “Observatory” 1830, from W.G. Herdman’s “Pictorial Relics of Ancient Liverpool”. The astronomical observatory on Bidston Hill was not completed until 1866, when it replaced the earlier Liverpool Observatory at Waterlook Dock. So why did Herdman describe this engraving, based on a sketch he made in 1830, as the Bidston Hill Observatory? 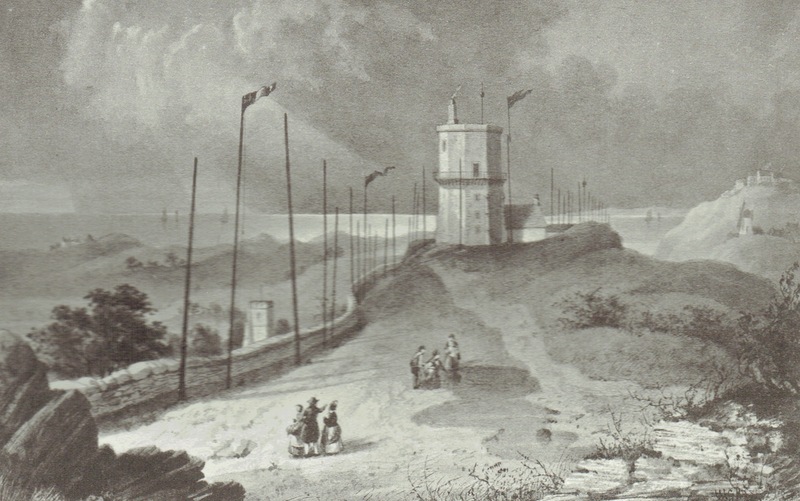 When I first came across this engraving, in a postcard published much later, I assumed that the mistake was made in the twentieth century, after the flag signals, semaphore telegraph and lighthouse itself had become little more than footnotes in the history of Bidston Observatory. But Herdman was writing at a time when the Lighthouse and Observatory were both operating, and he chose to describe the 1830 scene as Bidston Hill Observatory. Was Herdman merely using “Bidston Hill Observatory” to refer to the site as it would have been known to his readers in 1878? Or was he using the word Observatory in a more general sense than the astronomical? It was not unknown for lookouts such as were attached to semaphore stations to be called observatories. They were equipped with telescopes and part of their function was to observe, not the sky, but the sea. This is the full text of Herdman’s description of Bidston Hill Observatory, transcribed from pages 62-63 of “Pictorial Relics of Ancient Liverpool”, Volume 2, 1878. This is from an original Drawing by the Author, dated 1830, and shows the ancient mode of telegraphy. The site is at present occupied by the new Observatory and Lighthouse, the old buildings, erected in 1771, having been taken down in 1872. At the time the sketch was made, Bidston was a quiet rustic village, with its old-fashioned church, old hall, rural cottages, and country lanes, where on a summer’s day, one might discard the busy growing town of Liverpool, and enjoy balmy air, picturesque views, sandy walks, and if so inclined, good ham and eggs and good ale in the old-fashioned inn. The view from Bidston Hill during sunset on a fine summer’s evening is, even nowadays, worth journeying to see. The Lighthouse seen in the Plate would probably be rebuilt in 1771, for there is a very old drawing, once in the possession of the late H. Ecroyd Smith, Esq., of a lighthouse on the same spot, previous to this date, with a turret from its summit, which at the time the drawing was taken was evidently in a very dilapidated condition. 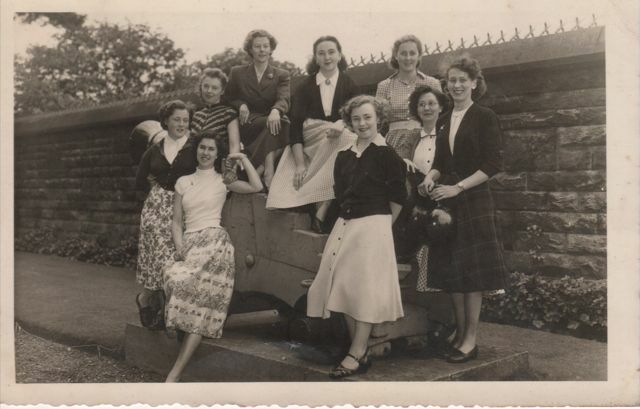 For many years Bidston Hill was a general resort of picnic parties and pleasure seekers. During the first half of this century it was entirely open to the public, and was only enclosed by the proprietor, Mr. Vyner, when the visitors began to abuse the privileges accorded them. The Drawing is especially interesting in this progressive age, when electricity has given birth to such invaluable inventions as the telegraph, telephone, &c., as showing the old mode of telegraphy, even up to recent periods. 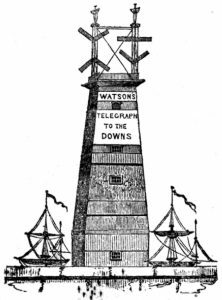 The poles seen in the Drawing were of varying heights, and, with the assistance of flags, communication as to the arrival of vessels off Holyhead were conveyed to the Telegraph Station in Liverpool, and thence to the several shipowners, who had their own special pole and signal-flag. 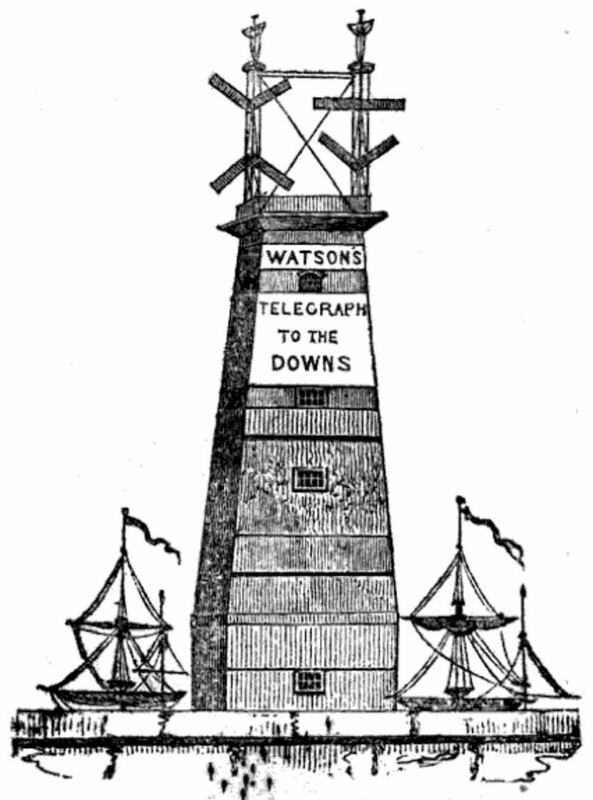 The proposition for this particular mode of telegraphy, the principle of which is the French semaphore, is said to have been made in 1803 by a Mr. Boaz, and was part of his system of telegraphs for communication between Liverpool, Holyhead and the principal seaports of the United Kingdom. Originally the Liverpool Station was on the top of a warehouse in Chapel Street. This was afterwards removed to the summit of the tower in the Old Church Yard. 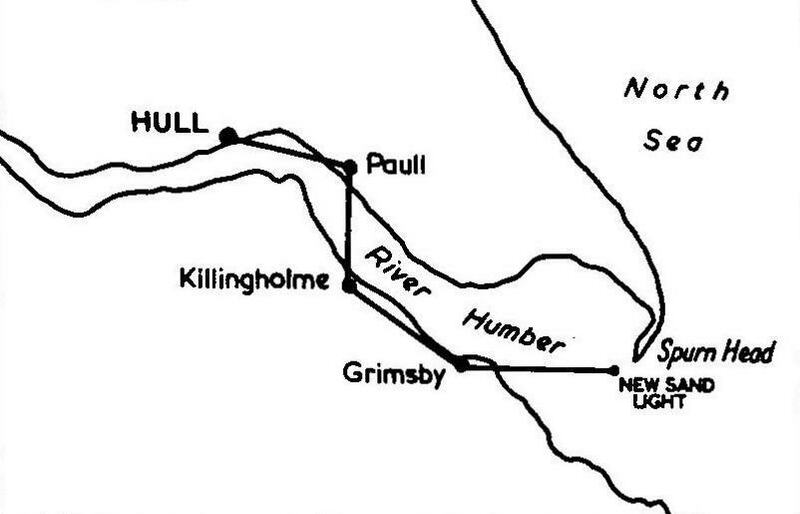 In the instance now under notice the first communication was with Bidston Hill, afterwards with Hilbre Island, then with Talacre, and eventually with Holyhead. This mode of telegraphy, simple though it was, was most useful in its day, but, like many other discoveries, has given way to the ever-increasing wonders of modern science. There is much to intrigue the historian in Herdman’s engraving and description. 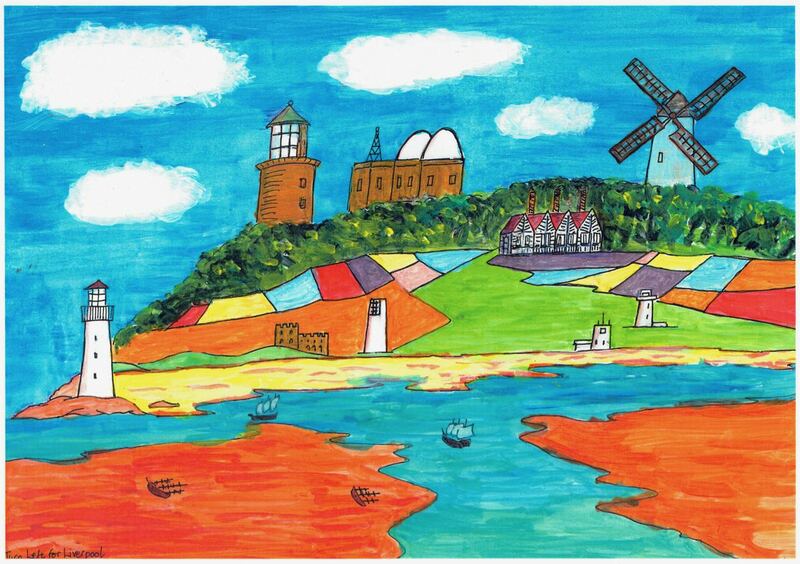 The windmill in the distance is not Bidston Windmill, but Wallasey Mill, now disappeared. We know that, for much of its length, the line of the flagpoles was closer to the ridge of Bidston Hill than to Penny-a-Day-Dyke , but perhaps the ones nearest the lighthouse were indeed located close by the medieval wall, as Herdman has drawn them. 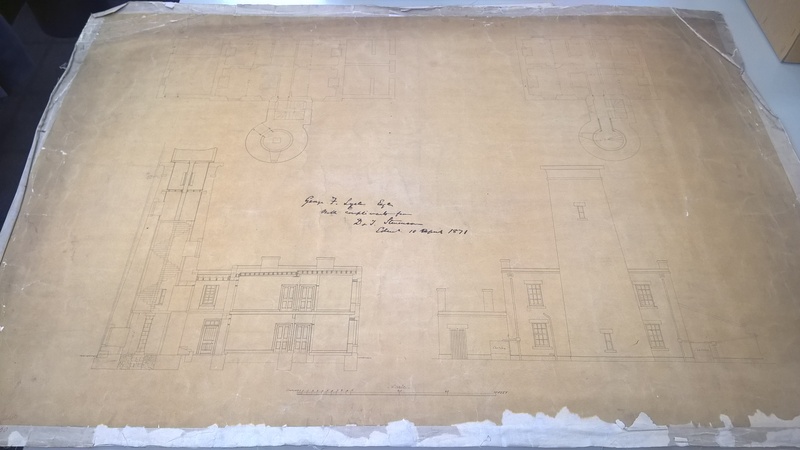 And what of the “very old drawing, once in the possession of the late H. Ecroyd Smith” – could it be this one? Herdman draws no clear distinction between the flag signals and the semaphore telegraph, and writes as though the flags were part of the method of communication between Liverpool and Holyhead. But the semaphore telegraph came much later than the flag signals, which date back to 1763. However, it is plausible that following the advent of the Liverpool-Holyhead Telegraph in 1826, news carried from Holyhead by the telegraph might cause the hoisting of a shipowner’s flag; certainly something similar happened in Tasmania in the 1830s, where messages carried by a semaphore telegraph from Low Head along the Tamar River to Launceston were converted to flag signals at the last stage for the convenience of the town. The mention of Mr Boaz’s proposition in 1803 is one to follow up. 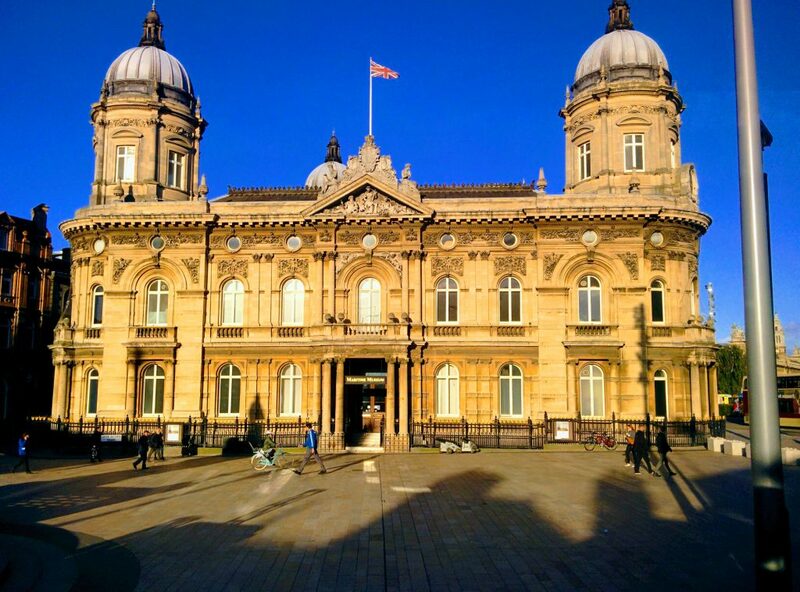 We know that in 1804, during the Napoleonic wars, the Admiralty established a number of signal stations between Liverpool and Holyhead. (The alarm beacon on Bidston Hill was set up at the same time.) We know very little about the coastal signals stations. They were located at Liverpool (St. Domingo), Bidston Hill, Point of Ayr, Cabe Hill, Great Orme’s Head, Point Lynas and Holyhead. They wouldn’t have been semaphore stations in the strict sense of the term – at the time, Britain’s telegraphs were based on a shutter system. The coastal signal stations probably used a flag and ball system. Part of their purpose was to observe and communicate with ships at sea – and they were often called observatories in contemporary writing. Whether they were intended to communicate with each other is not clear. The locations of the telegraph stations of 1826, built by the Port of Liverpool under the direction of Barnard Lindsay Watson, are thought to have coincided roughly with the earlier Admiralty signal stations, which had fallen into disuse following the defeat of Napoleon. Confirmation of sorts for “Mr Boaz’s proposition” is provided by the following article, which appeared in the July 1804 issue of the Scots Magazine, in the Literary and Scientific Notices section. A plan of a Telegraphic Establishment for Domestic and Commercial Purposes having been suggested some time since to Mr Boaz, the ingenious patentee of a Day and Night Telegraph, that gentleman has lately submitted proposals for a local experiment to the inhabitants of Liverpool. A line of Telegraphs is in consequence about to be established from Liverpool to Holyhead, for the purpose of announcing the arrival of ships bound for Liverpool, and of procuring pilots. Another line has been suggested, from Liverpool to Hull, through Manchester and Leeds; and another from Liverpool to London, thro’ Chester and Birmingham. These several lines would not cost more than £15,000, and on a moderate calculation of the messages which would be sent through them, at a rate of a guinea per eight words per 100 miles, there is no doubt, but the establishment would, on the average, net an annual profit of 2 or 300 per cent. The person with whom this plan originated, hoped to see it executed by government, and a telegraphic establishment extended from the metropolis to every market town in the kingdom ; but it is probable that its utility and profit must first be demonstrated by the experiment of private individuals, before the nation at large can be made to participate in the advantages of so wonderful a system of conveying intelligence — a system which would confer a sort of ubiquity on those who might choose to avail themselves of it, and which would render the whole of this busy and extended nation like one concentrated metropolis. This, too, is intriguing. It seems absurd that Liverpool could have been setting up a genuine commercial telegraph at the same time that the Admiralty was installing coastal signals stations along the same route. Nor does it seem likely that the Admiralty would condone its signals stations to be used for the purposes described. But it does suggest that the stations under construction in 1804 may indeed have been intended to communicate with each other. This entry was posted in Bidston Hill, History, Lighthouse, News and tagged BidstonHill, BidstonLighthouse, BidstonObservatory, Herdman, Hull, Liverpool, Semaphore, Signals, Wirral on 20th December 2016 by admin. Bidston Lighthouse is the world’s most inland lighthouse. By this I mean that of all the lighthouses in the world that were constructed as genuine navigational aids to mariners, none were built further from the body of water they lit than Bidston’s. Liverpool’s Sea Lights were a pair of leading lights that guided ships through the Horse Channel. A line drawn from the upper light at Bidston through the lower light at Leasowe crosses the high water mark on Mockbeggar Wharf at a distance of 2.1 nautical miles (2.4 statute miles, or 3.9 kilometres). The distance between the upper and lower lights is 2 nautical miles (2.3 statute miles or 3.7 kilometres), also making the Sea Lights the furthest apart of any pair of leading lights in the world. There are, of course, many lighthouses further from the sea than Bidston’s. They can be found on river banks, or canals, or lake shores, and have provided valuable service to mariners as navigational aids. But these were all built relatively close to the body of water that they lit. I also rule out aerial lighthouses, such as the one at RAF Cranwell, in Lincolnshire. A few of these were built as navigational aids to pilots, not mariners, and they lit the sky, not the sea. Some otherwise interesting “lighthouses” are disqualified on the grounds of not being genuine navigational aids to mariners. During the 1920s, Benito Mussolini ordered the construction of a lighthouse atop his summer palace at Rocca delle Caminate, some 25 kilometres from the Adriatic Sea, and commanded the Italian Navy to include it in their list of operational lights. Flashing red, white and blue when Il Duco was in residence, it provided good service as a monument to the dictator’s vanity. Perhaps it helped the locals find their way home in the dark, but it was of no use to mariners as a navigational aid. 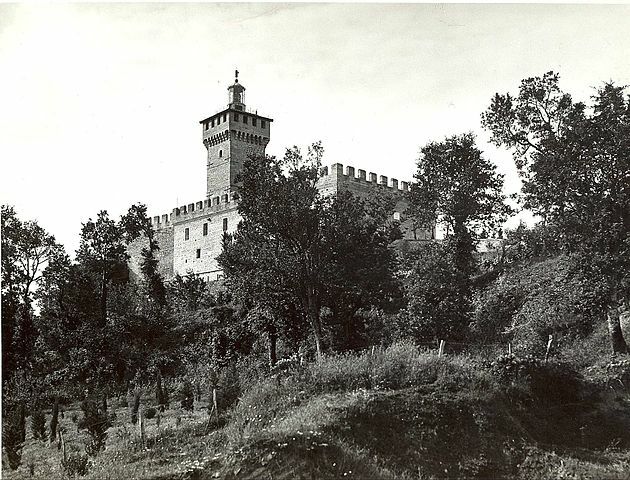 Rocca delle Caminate in 1939. Photo by E. Zoli Forlì. Cape Todd Lighthouse stands in the desert of central Australia, near Alice Springs, on the banks of the Todd River, which is usually dry. That doesn’t stop the Aussies from holding the annual Henley-on-Todd regatta, in which contestants bring their own bottomless boats and carry them at a run along the Todd River. They like to claim that the Lighthouse is a navigational aid, because it stops the contestants from running out of bounds during the race. 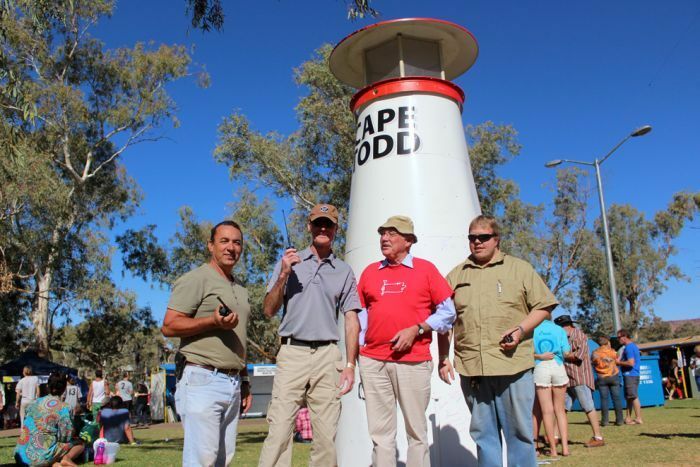 Built by amateur radio enthusiasts, Cape Todd Lighthouse took part in the International Lighthouse and Lightship Weekend in 2013 and again in 2014, when it was listed as a “faux” lighthouse. I stand by my claim until such time as someone provides evidence of a greater distance, or the Italian Navy blockades Liverpool in protest. 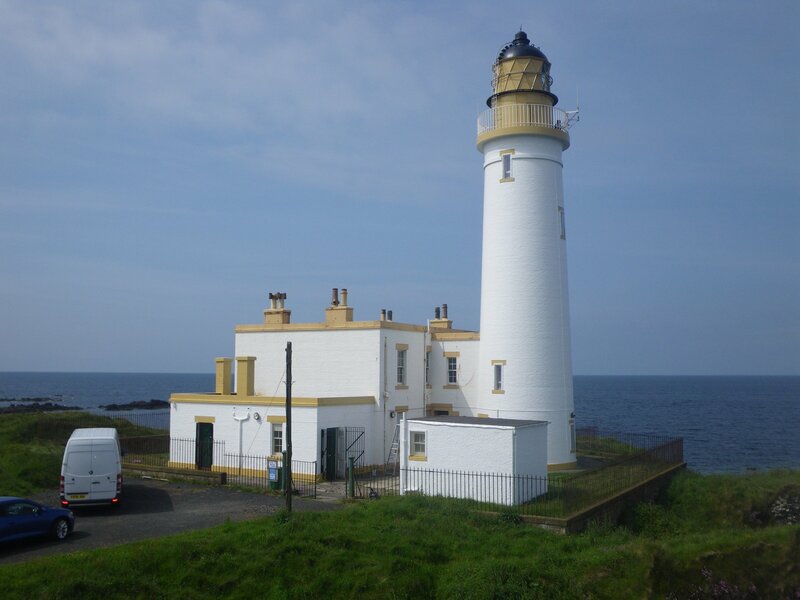 If you do know of any interesting inland lighthouses, please let us know by commenting on this post. We’d also like to hear about any claims for the most inland operational lighthouse, or for the most widely separated operational pairs of leading lights. Rocca delle Caminate on Russ Rowlett’s excellent Lighthouse Directory website. How does the Amateur Radio Lighthouse Society define a lighthouse? This entry was posted in Bidston Hill, History, Lighthouse, News and tagged BidstonHill, BidstonLighthouse, History, lighthouse, Liverpool, navigation, Radio on 20th June 2016 by admin. Lighthouse keeping is generally regarded as a male profession. 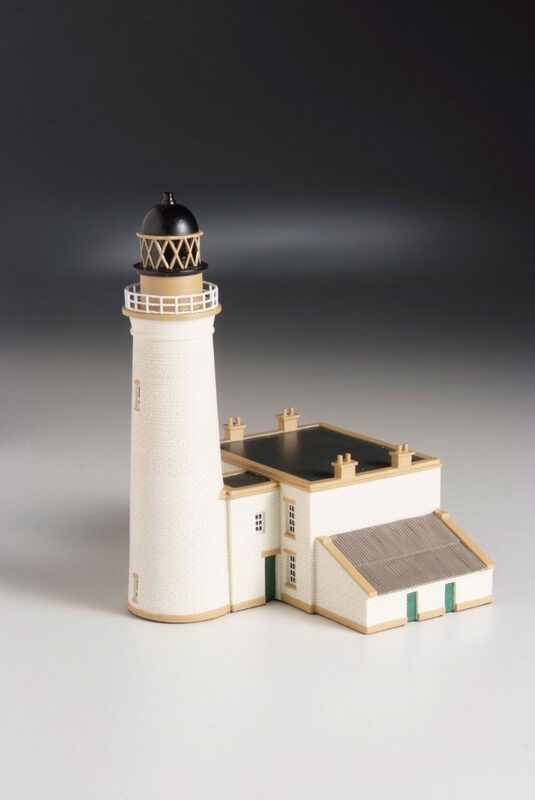 But it was not uncommon for a lighthouse keeper to be assisted by his family, and no doubt many seafarers owe their lives to the wives and daughters who kept the light burning when the keeper was ill, asleep or in his cups. Most of these women have been forgotten by history, with the notable exception of Grace Darling. Lucy, the keeper in Margaret Elphinstone’s well-researched and insightful novel “Light“, is fictional. Trinity House, which celebrated its 500th anniversary in 2014, never appointed a woman to the post of Principal Keeper (PK). It probably never will, because the UK’s last manned lighthouse, North Foreland, was automated in 1998. Liverpool’s Dock Committee was more enlightened. They appointed Elizabeth Wilding as keeper of Bidston Lighthouse in 1797 (albeit with conditions attached), following the death of her husband Richard. She was succeeded by her son-in-law and assistant William Urmson in 1800. Ann Urmson, William’s second daughter by his second wife, was PK at Bidston from 1835 until 12 May 1869. Richard, Elizabeth, William and Ann all died in service. William’s other daughters helped at the Bidston station: Jane kept the telegraph, and Catherine assisted at the lighthouse. Leasowe Lighthouse also had two female Principal Keepers. When John Jones was dismissed “for intoxication and insubordination” in 1854, his wife Ann was appointed in his place. John died in 1857, still a resident of the lighthouse. Ann Jones died in service on 23 Jul 1867. [1, pages 33-34]. The last lighthouse keeper at Leasowe Lighthouse was Mary Elizabeth Williams. When her husband Thomas Williams died in 1894, Mrs Williams took over as PK. Apart from the lighthouse, she also had eight children (including a baby) to look after. Fortunately, some of her children were old enough to help. She was still in post when Leasowe’s light was discontinued on 15 July 1908. After the closure, she carried on as caretaker until November of the following year [1, pages 37-40]. Elizabeth Wilding was the first female lighthouse keeper to be appointed by Liverpool. But the Chester trustees were a few years ahead, having appointed Mrs Cormes as keeper of Point of Ayr Lighthouse in 1791 [1, page 46]. In 1975, the Lancaster Port Commission appointed Peggy Braithwaite née Swarbrick (9 Jul 1919 – 12 Jan 1996) as Principal Keeper of Walney Island Lighthouse, when her husband, the lighthouse keeper, died. Peggy retired at the age of 74. If you know of any women who served as Principal Keeper, please let us know by commenting on this post. John and Diane Robinson, Lighthouses of Liverpool Bay, Tempus Publishing Ltd, 2011. This entry was posted in History, Lighthouse, News and tagged BidstonLighthouse, History, keeper, Leasowe, lighthouse, Liverpool, Trinity House, women on 12th June 2016 by admin. Our latest acquisition is this memorandum from the Secretary of the Mersey Docks and Harbour Board to George F. Lyster, the man who built Bidston Lighthouse and Bidston Observatory (and many other important buildings and docks). The memorandum is dated 15 April 1889. In red ink, initialled by GFL, there is a brief instruction addressed to AGL. At the foot of the memo there is a longer reply to the secretary, initialled by AGL. GFL is George Fosbery Lyster (1821-1899), then Engineer-in-Chief to the Mersey Docks and Harbour Board. AGL is his 37-year old son, Anthony George Lyster (1852-1920). The following year, Anthony became Acting Engineer-in-Chief to the MDHB. He eventually succeeded his father as Engineer-in-Chief when George retired in 1897. 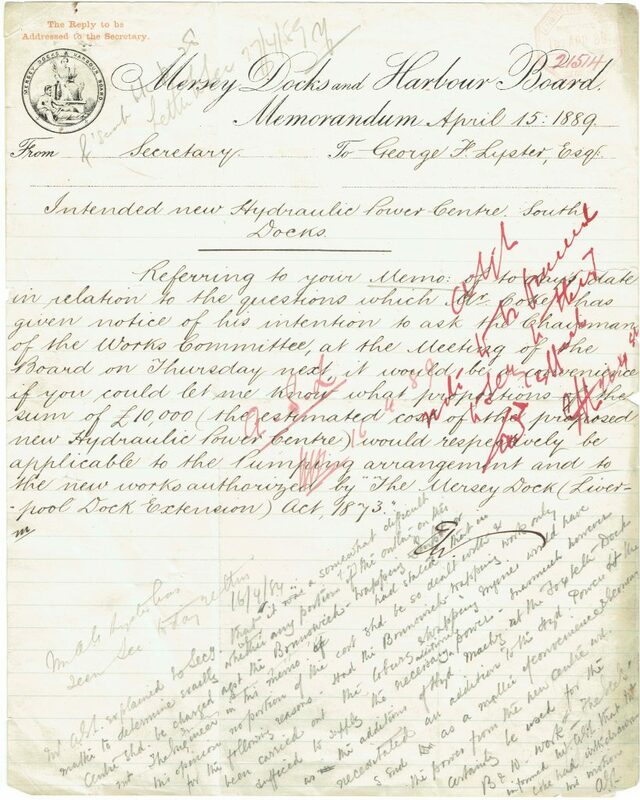 This memo shows that the father was already in the habit of delegating to his son in 1889. Between them, George Fosbery Lyster and Anthony George Lyster probably added more acreage to the docks of Liverpool and Birkenhead than their predecessors Jesse Hartley and his son John Bernard Hartley. We are delighted to have this sample of the handwriting of both father and son in a single document. This entry was posted in History, Lighthouse and tagged Architecure, BidstonLighthouse, BidstonObservatory, Hartley, Heritage, Liverpool, Lyster, MDHB on 15th May 2016 by admin.